It's that time of year when the weather goes cold and you're wanting a nice pair of boots to slog around in...historically, of course. Ladies of the past had a broad assortment of winter footwear to choose from - tall boots, overshoes and carriage boots, side-buttoning and elastic-sided boots, and so on. Before the 1780s, women wore men's style boots for hunting and riding, but by the last two decades of the 18th century, feminine styles were coming in to fashion. 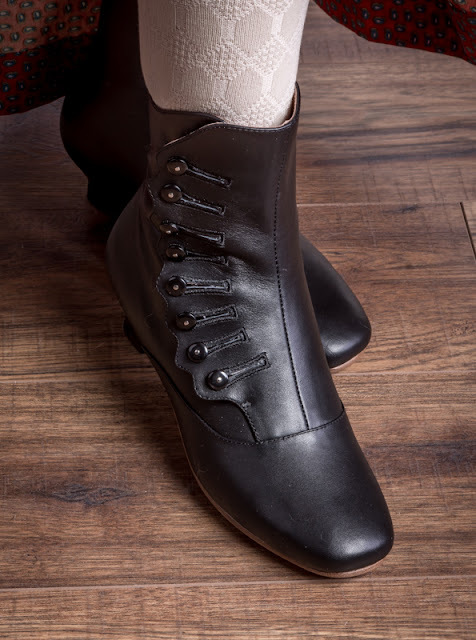 Tall-lacing riding and walking boots with fashionable pointed toes and small Italian heels were all the rage and continued through the early 19th century. Our Mansfields come in black and dark pine green, trimmed with black grosgrain. The tiny 1 inch Italian heel is very comfortable and cute. These boots have been sized with enough width so your toes aren't smooshed to death in the point, plus the lacing is adjustable for a variety of ankle sizes. Shop Mansfields in our Regency section. Women in the mid-Victorian period loved their boots. A great variety became available in classic leathers but also in fun two-tones and with trims such fringe, tassels, bows, and rosettes. 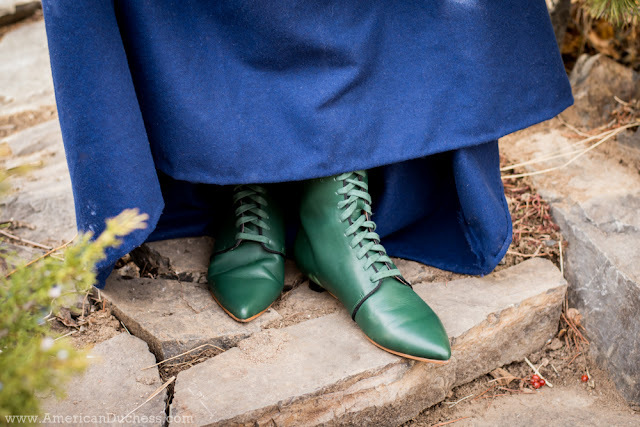 It is also in this period that the elastic-sided boot was invented and became hugely popular, allowing ladies to just slide their boots on and go about their business for the rest of the day without ever having to bend over in their corsets to re-tie their footwear. Vienna Congress Boots - elastic-sided mid-Victorian slip-on boots with bows. 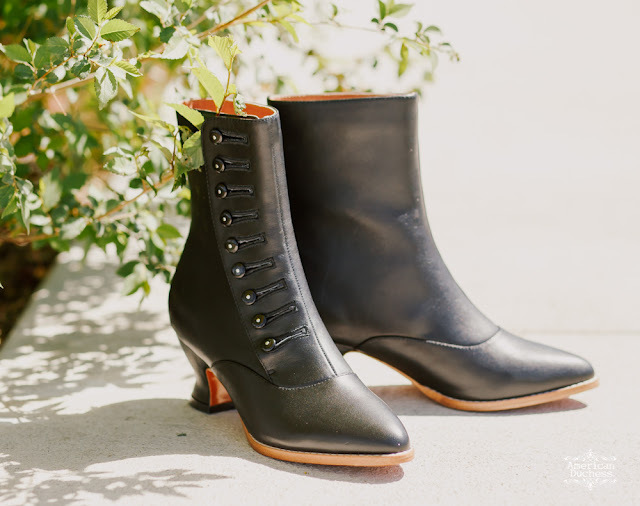 Renoir Civil War Side-Button Boots in classic black leather. Don't forget your button hook! We've restocked a favorite - Renoir Button Boots - and added a new, super-cute style, Vienna Elastic-Sided Congress Boots. Both of these pretties are accurate for the late 1850s all the way to the 1880s, with the softly-square toe and 1.5 inch knock-on heels. By the end of the Victorian period, and into the early 20th century, boots became quite fanciful. Cutouts, two-tones, scallops, bows, appliques, and very tall and curvaceous French heels made this an exciting period of ladies' footwear. 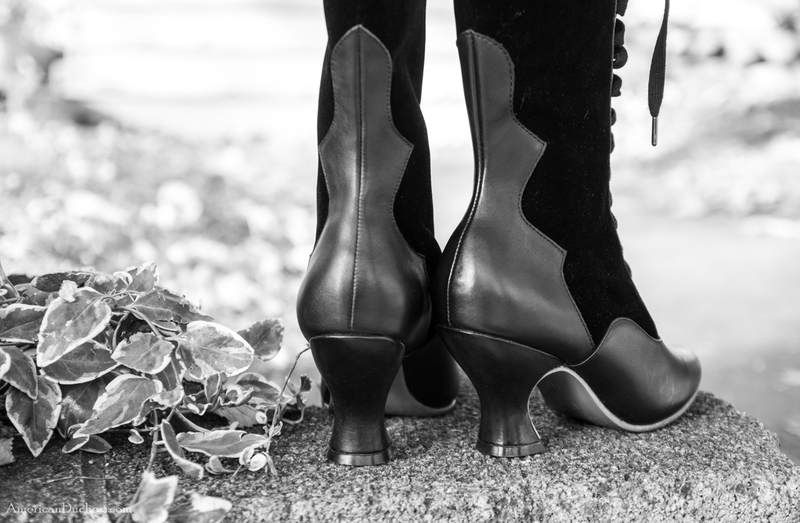 Camille Edwardian Boots in black velveteen and leather. Ooh la la! 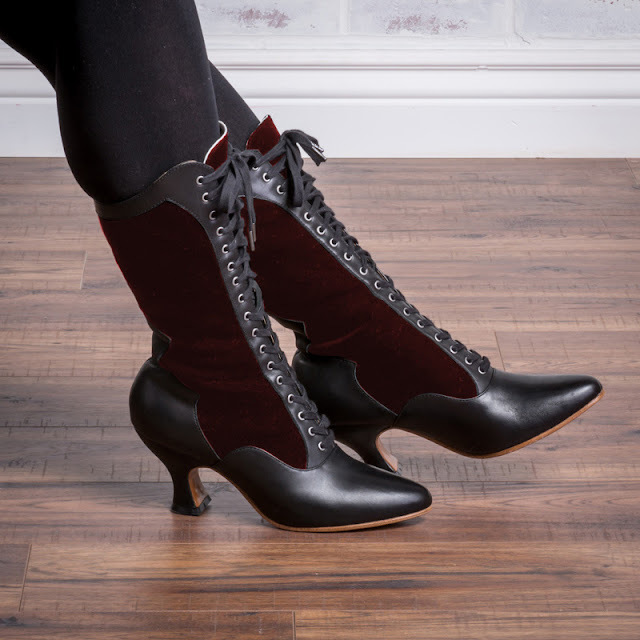 Camille Edwardian Boots in dark red velveteen and black leather. They really are all that and a bag of Edwardian chips. The breakout star of this season's collection are the new "Camille" boots in velveteen and leather. These tall boots have a 3 inch French heel and almond-shaped toe. They fit excellently through the ankle and have adjustable laces. Side-buttoning boots continued in fashion into the late Victorian period all the way through the 1920s. These fashionable boots stayed securely fastened all day long and looked great all the while. Tavistock Side-Button Edwardian Boots. New, improved, also less expensive. Aw yisssss. Don't forget that button hook! Our most popular style, Tavistock, has returned with a few changes - leather soles and a better-fit through the ankle and leg make these beautiful boots a perennial favorite. Snag a pair of Tavistocks and enjoy a comfortable 2 inch French heel along with the unique experience of using a button hook. 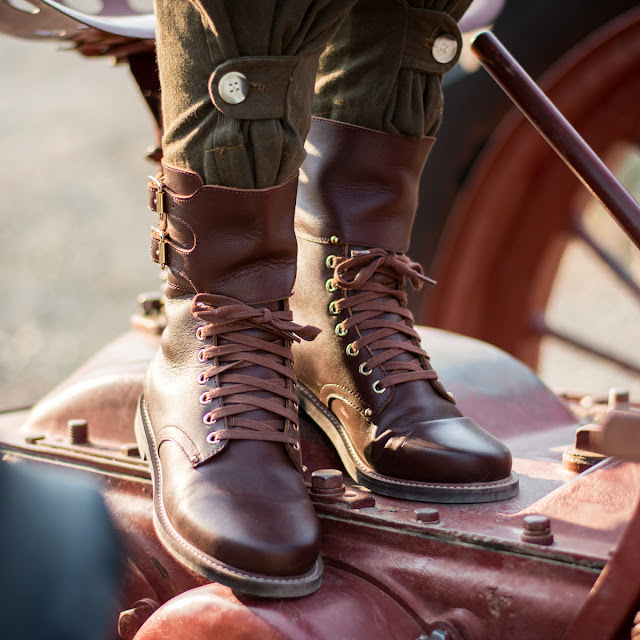 Shop Tavistock Button Boots in the Edwardian section. If you'd like to wear your boots in the ice and snow, we highly recommend having rubber half-soles put on at a shoe repair shop. We sole our shoes with leather, but while this is the historically accurate material it can be pretty slippy. We have adhesive rubber pads to help with grip, but a rubber half-sole is the safest option and will also extend the life of your soles. Check out our vintage shop, Royal Vintage Shoes. This season we have "Aspen" 1940s booties in velveteen and leather, trimmed with sheepskin, plus the wonderful "Rosie" WW2 Double Buckle Boots are *on sale* ! Shop Royal Vintage Shoes here. Rosie WW2 Double Buckle Boots - true reproductions, and just really flippin' cool.